Search giant Google has finally unveiled the new version of its very popular (which is like understatement!) Android operating system. But instead of naming it Key Lime Pie, which it what the reports were claiming it would be named, or even Kaju Katli (an unsuccessful attempt by a couple of Indians), the company has named it after Nestle's popular chocolate KitKat. The company also disclosed that the Android OS is currently powering over a billion smartphones and tablets around the globe. "Since these devices make our lives so sweet, each Android version is named after a dessert. 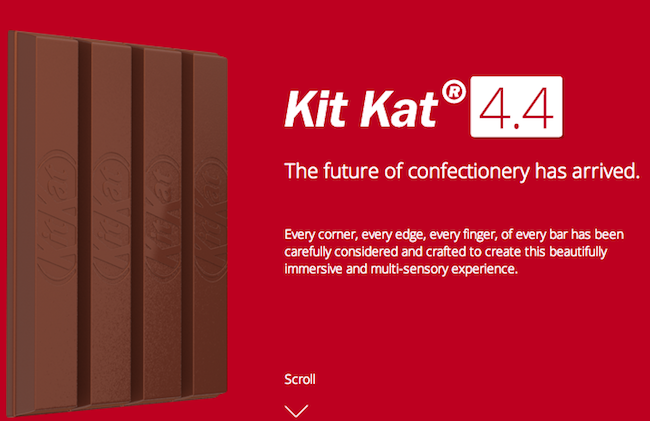 As everybody finds it difficult to stay away from chocolate, we decided to name the next version of Android after one of our favorite chocolate treats, KitKat," read a message on the official Android 4.4 site. And while both Google and Nestle claim that there is no monetary factor attached to the partnership, it has not stopped both parties from promoting the other. Over 50 million Android KitKat bars (specially branded Kit Kat candy bars featuring the Android robot) will be available in 19 countries including India, the UK, the US, Germany, Japan, etc., and people purchasing the same will get a chance to win Nexus 7 tablets or Google Play store credit. It even talks about the technical specifications of the chocolate, mentioning its one finger long, four finger thick dimensions, and universal compatibility. Android 1.5, Cupcake; Android 1.6, Donut; Android 2.0, Eclair; Android 2.2, Froyo; Android 2.3, Gingerbread; Android 3.0, Honeycomb; Android 4.0, Ice Cream Sandwich; Android 4.1, Jelly Bean; and now Android 4.4, KitKat. Note that the company has named this version Android 4.4 instead of Android 5.0, hinting that the new version will not be a complete overhaul of the OS; rather it could be a number of smaller tweaks.